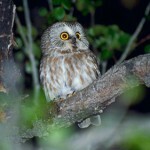 In spring, “hoooo” hooted at intervals; and cat-like calls. Description: Sexes similar. Smaller than a Great Horned Owl. 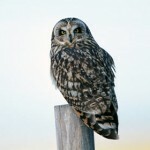 A slender owl; long, close-set ear tufts; lacks a white throat; vertical chest markings (as opposed to horizontal in Great Horned Owl); rusty facial disk; yellow eyes; and dark bill. 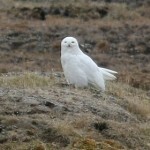 Behavior: Strictly nocturnal; hunts at night over open fields and marshes. Habitat: Associated with wooded areas such as bottomland forests, parks, orchards, and woodlots. Coniferous forests are apparently preferred over hardwood forests. Where in Nebraska: Uncommon permanent resident in eastern Nebraska, becoming rarer westwardly. Will breed in the state. Some birds migrate from the north to Nebraska during the winter. Field Notes: Can be found roosting during the day near the trunks of trees. 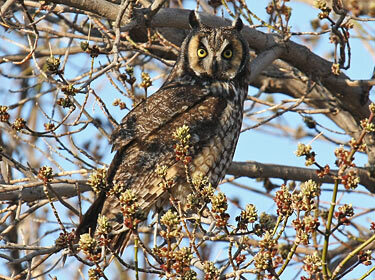 Fun Facts: The Long-eared Owl has been shown to be able to catch mice in complete darkness.